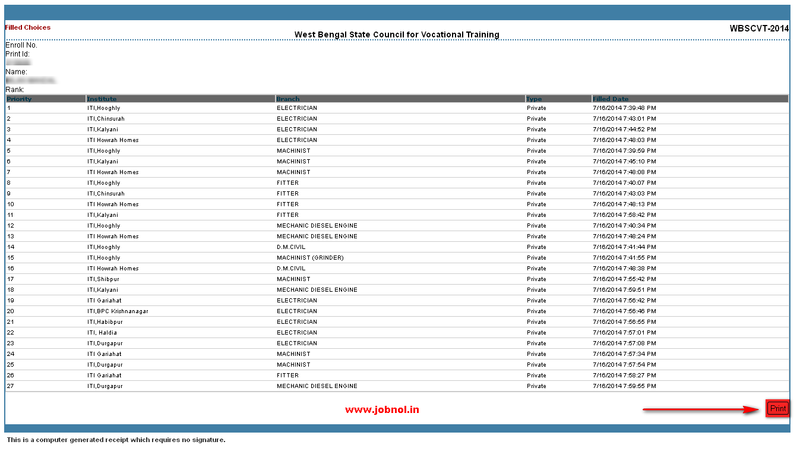 WBSCVT ITI Online Counseling 2016; WBSCVT ITI Online Counseling to be started from 27/06/2016 A Photo (Screenshot) wise Step by Step Guide has been made to help out the candidates willing to take admission in ITI/ITC/Jr Polytechnic Institutes under West Bengal. 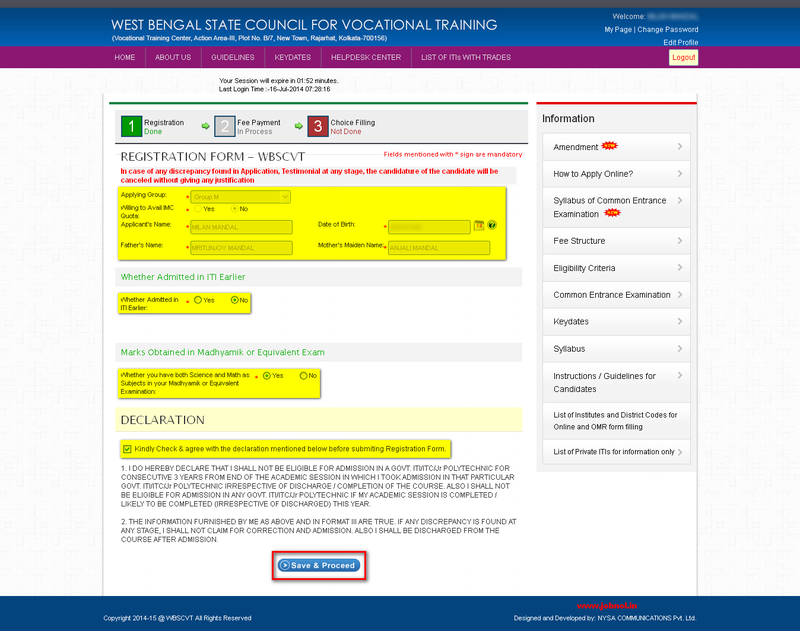 This post will give you the best pre registration knowledge of the whole process of WBSCVT ITI Online Counseling and Choice Filling 2016. Please read this post. Dear Candidates, Online counseling for admission in Govt. ITIs will start from 13/08/2016. Pl. visit www.wbscvt.net for online choice filling. e-cash coupons for this purpose will be available in Govt ITIs from 12/08/2016. 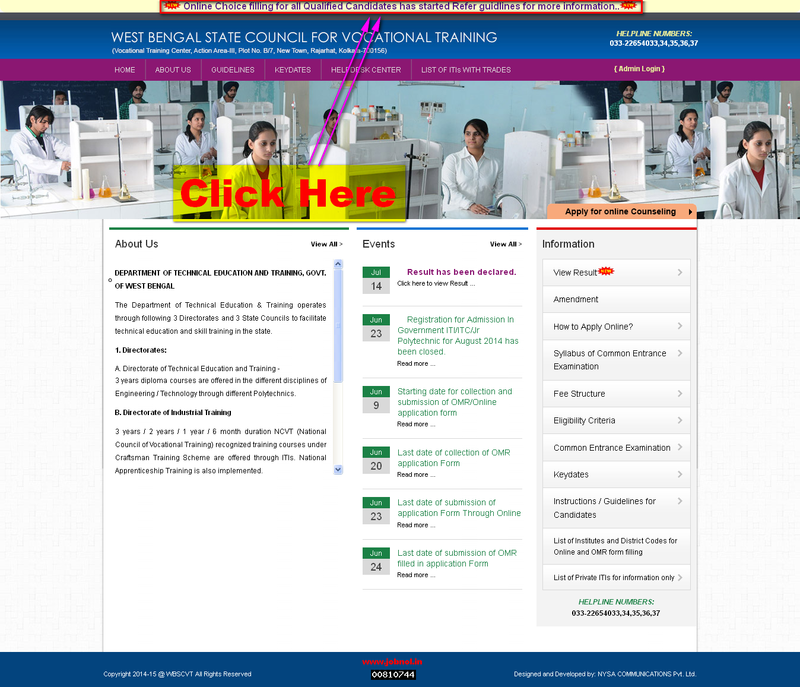 List of ITI's is at www.wbscvt.net, Best wishes, WBSCVT. (The link will open in a new tab) and click on the top link as shown in the image below. Here you have to login to your counseling account. Your Application No/Roll No and Date of Birth will be required to login. The option Application No is set default but you may choose Roll No option if you wish (choose anyone) and then Provide Date of Birth (YYYY/MM/DD) and then Click "Login" to open your profile. After login you will be shown a popup containing the text "Confirm your registration details before proceeding for the online counseling fee payment and choice filling." here you have to click on "Click here to proceed"
In this Page you need to confirm all the particulars of you is shown here. please check the same and here you will also be asked two questions which should be answered in clicking respective radio button. After Answering the above questions you will have to accept & agree with Terms & Conditions provided. Put a tick mark on the check box and Click on "Save & Proceed" to Go Next Option. Here you will see a massage that is "Your registration details has been updates successfully" you need to click on "Ok" and and go for next step. Now click on "Click here to Print form" from My Status section. A popup-tab will appear containing your Application Form and you need to click on "Print" button to get your Application Form printed. After Taking Printout please close the tab to return to your Counseling My Page Section. Now is the turn to pay counseling fee, for this you nee to purchase E-CASH Coupon of Rs. 200/- from HELP Deks centers (Click here [*New Tab*] for List of HelpDesk center where you can get E-CASH Coupon). 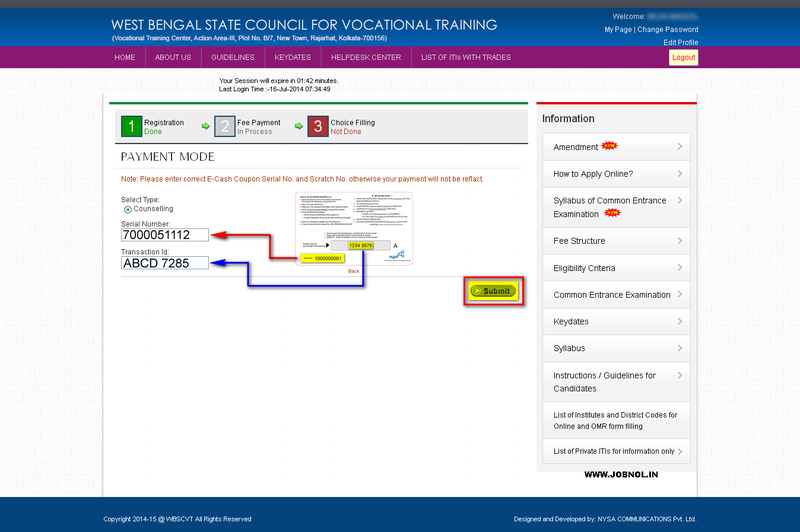 Now Click on "Pay Counseling Fee !!" from your My Status Section to Pay your fee. Now Click on the Radio button "E-Cash coupon Receipt" and a details of instruction will appear immediately which will inform you that how you can pay fee through E-Cash Coupon. Read Carefully and click on "Proceed" button at the bottom of the page. Here you need to click on "Ok" to proceed to Choice filling. On successful payment you will see that your Payment Status will be in green colour. that indicates you are now eligible to fill your choice (Institute & Trade combination) for online counseling. Now you should click on "Click here to fill choices !!" option to start filling your choice. 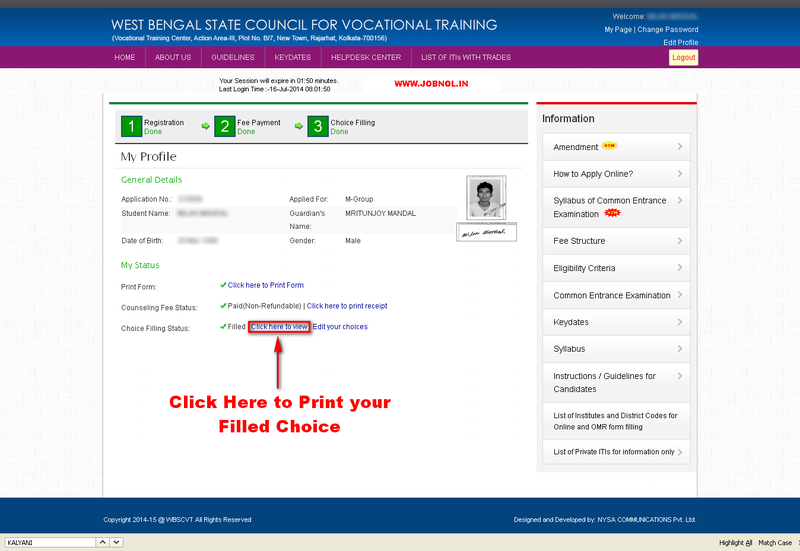 When the choice filling page will appear then you will see a massage that provided flowing, read this before you start filling online choice filling. After reading click on "Click here to Proceed.." to start final choice filling. Candidate applied for “M” group of trade can only be allowed to provide choice for “M” group of trades available in different Govt. ITIs only. List attached with this document. Candidate applied for “E” group of trade can only be allowed to provide choice for “E” group of trades available in different Govt. ITIs only. Candidates not having Mathematics & Science will not be allowed to provide choice for any engineering trade in “M” group. Candidates previously admitted in any trade (of any Group) of a Govt. ITI/ITC/JP (irrespective of completed the course or discharged from the course) shall not be eligible for admission in that particular ITI/ITC/JP for consecutive three years from his pass out year. A trainee appeared/Passed out/ discharged from any Govt. ITI/ITC/JP shall not be eligible for admission in any other Govt. ITI/ITC/JP for the session starting from the next academic year. 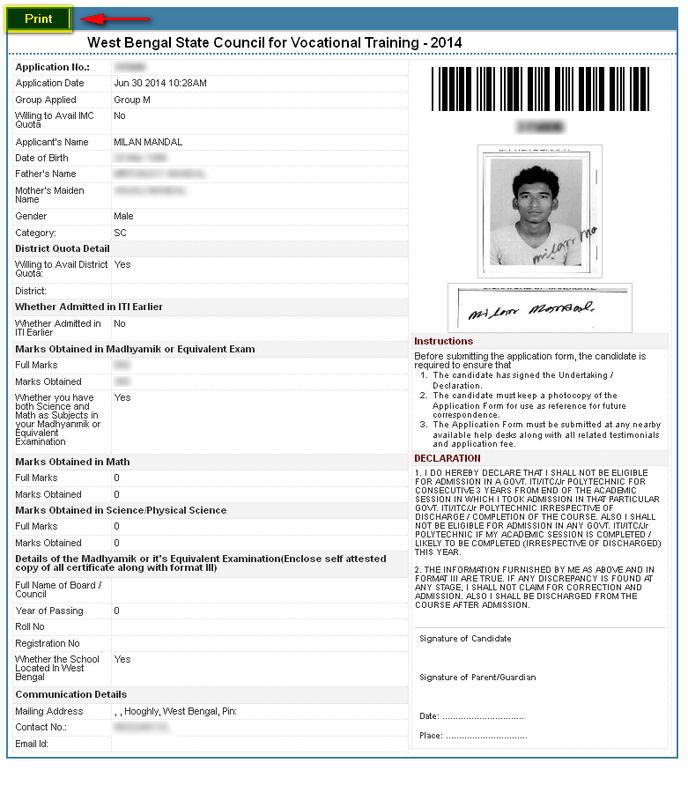 This rule shall not be applicable for admission in Advanced Module courses.” This Logic should be strictly maintained at the time of choice filling by the candidates and the input as already taken in the application form regarding this issue must be re verified. Just before you start online choice filling you should know the the sections of choice filling page (see image below for details). 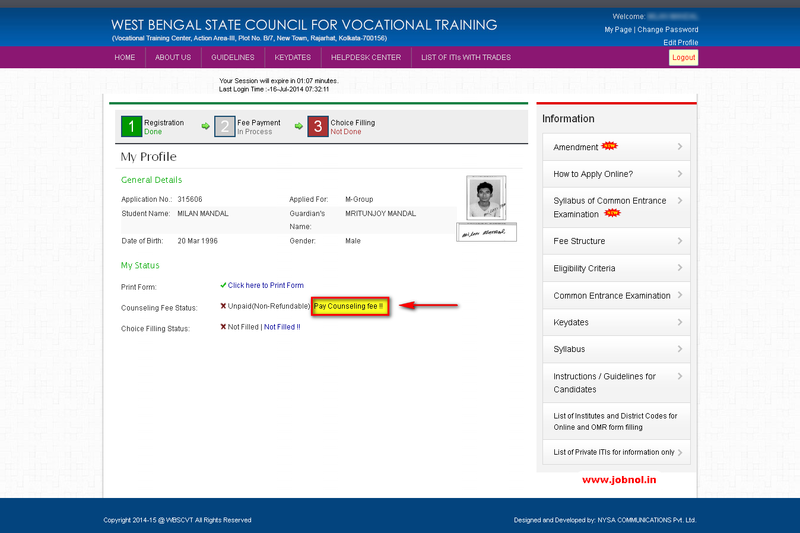 From the left panel Click on "Add" button of your desired institute and branch/trade combination. Your added choice will start gathering in the right panel, you should prefer adding the institute and trade combination first what you like the most although you can delete choice using delete icon, and you also can arrange your choices by using upper or down icon. There is no limit; you can add as much choices you want, and always try to give maximum choice to ensure seat allotment according to your Merit Rank Status. When you have finished adding your choices, only then lock your choices using "Lock" button (found at right bottom corner) > Click "Confirm" > Click on "Close". and then click on "My Page" option to go back to your counseling profile or My page Section. 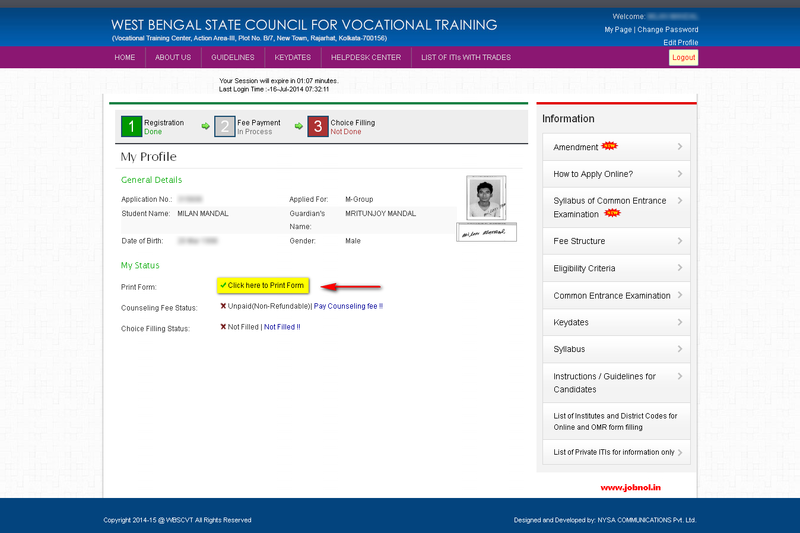 Now your choice filling process has been done, on successful choice filling you will see a green indication in your "My Status" section. Now you should take a print of your filled choices. Click on "Click here to view" option to get the list of your filled choices. Clicking the above will pops a page up containing the list of the choices you filled. now click on "Print" (see right bottom corner of the popup window) to get your choices printed on paper. Keep this printout for further needs. After taking printout close the "Popup print page" and go back to "My Page" Section and Click "Log Out" to sing off from your account. 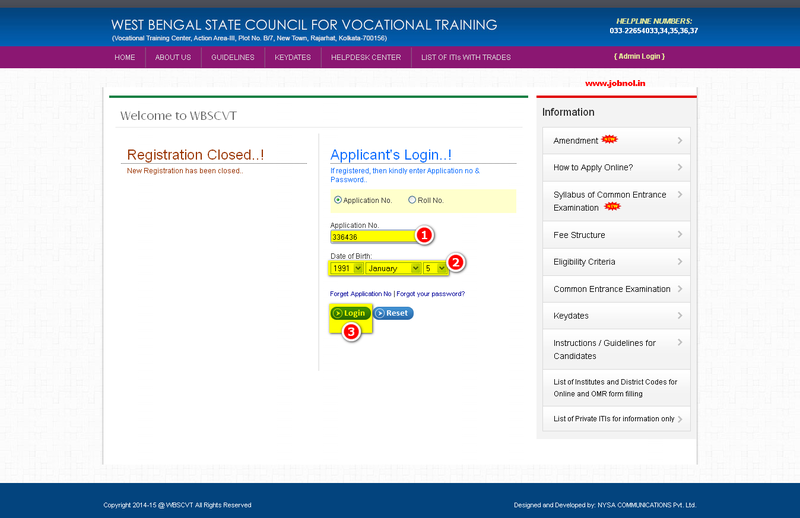 Now you have completed your choices filling process of WBSCVT ITI Online Counseling Process 2016, if you change your mind for choice filling you may change your filled choice by logging into your account and clicking on "Edit your choice" option from My Status section. Mind it; if you change your choice don't forget to take a print out of the latest filled choice for evidence. 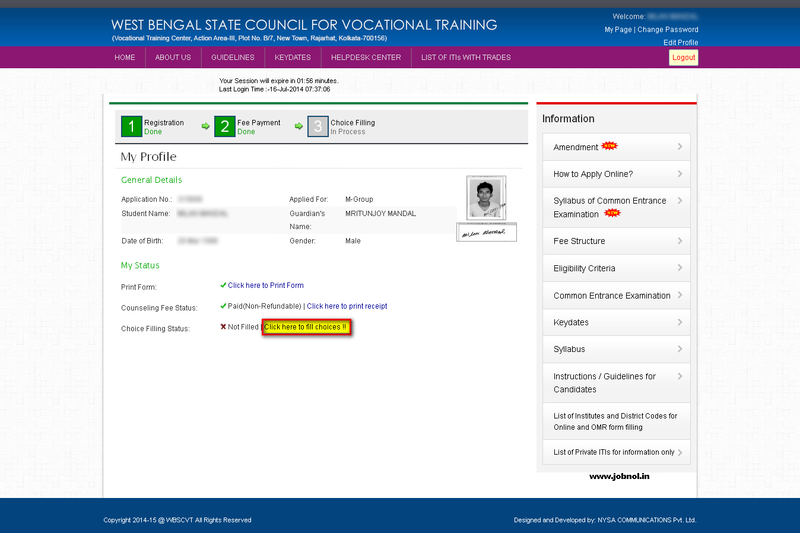 Feel free to ask any questions regarding ITI Online Counseling 2016 in the comment section of this post, you may ask in bengali, a google account is required to post comment. 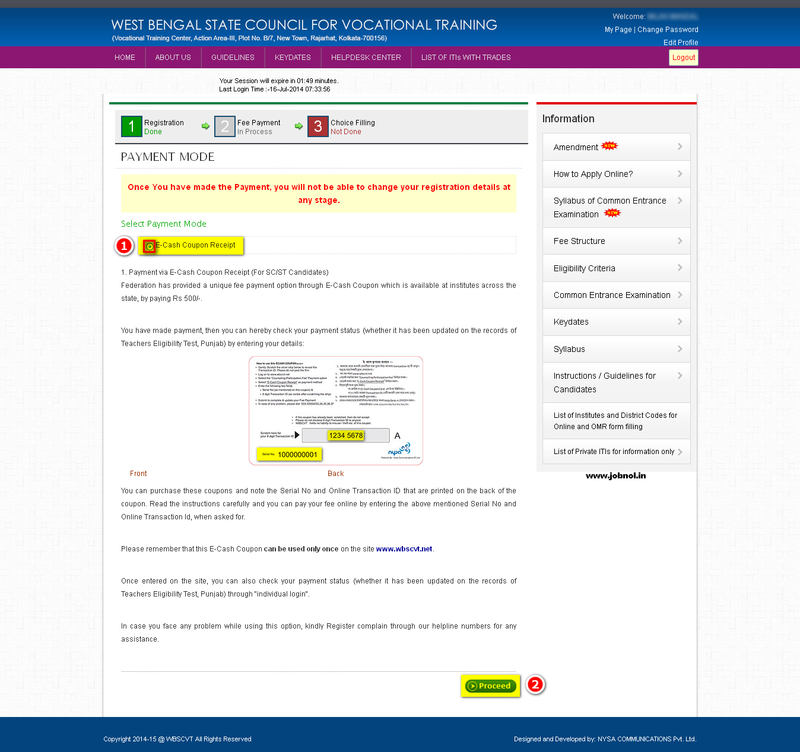 0 Comment to " WBSCVT ITI Online Counseling 2016 Choice Filling Guide with Screenshots - wbscvt.net "